My Kuhn line is filled with men who served their country. Our military legacy stretches back to the Revolutionary War, which means a large portion of my research time is devoted to military history and research. 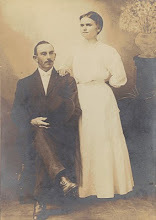 One ancestor that I have always been curious about is Warren Edward Kuhn. 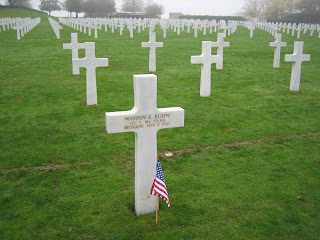 I knew from a very young age that Warren died in WWII and that my father was named after him. We didn't know very much about his service, other than that he served in the European theater and was buried in Henri-Chapelle American Cemetery in Belgium. My father has often told me the story about his visit to that cemetery during his military tour in Germany in the 1960s; it gave him a very strange feeling to see his own name on a headstone. Years later I was able to make my own visit to Henri-Chapelle to pay my respects on Veteran's Day. The cemetery is located in Belgium, just north of the village of Henri-Chapelle and only seven miles from the German border. In order to find the location of the headstone we stopped to visit with the cemetery administrator. He was very kind and when he found out we were looking for a relative's grave he took us to his office and prepared a packet of documents for us which included a printout of information from the American Battle Monuments Commission website and an official Presidential certificate honoring my uncle's service. He also escorted my husband and I to the grave and gave us a flag to honor him. I was floored and had not expected such a welcome or the level of respect for my fallen ancestor. I walked away from the experience realizing that I did not know anything about my uncle. I resolved to dig deeper and learn more about both him and his service. In a quick search on Ancestry.com I located the WWI, WWII, and Korean War Casualty Listings archive and found a listing on my uncle, which included his service number. As I did with my grandfather, I wrote to the National Personnel Records Center (NPRC) and requested a copy of his official military record file or OMPF. I could not use the eVetRecs service of the National Archives because I am not a direct descendant, but instead filled out the Standard Form 180. I sent my request on 4 September 2009. On 11 January 2010 I received a response. In the cover letter the archivist mentioned that the record I requested was in the portion of the NPRC that received the most damage during the fire there in 1973, but that they did have a few documents that were saved and for $60 I could get copies of them. That was a pretty steep price to pay, but I just couldn't say no. In March 2010 I received the documents in a packet 1/2" thick. It included all the paperwork from Warren's induction into the military. It also contained documents from March 1945 when he was killed in action. It included the place in Germany where he was injured and the injuries he sustained. I am not a morbid person, but for some reason it was very important to me to understand what he had gone through and where he had died. I received the information after I moved from Germany, but when I return I plan to visit the city where he was killed. My results for the request of his OMPF are not typical. Very few World War II Army personnel records we saved from the 1973 fire. That being said, there are still other options when researching Army veterans killed in action during WWII. Ancestry.com has many resources for military casualty listings which include not only service numbers but assigned units. Although it is a fee-based website many libraries offer the site for free. If you have the assigned unit you can trace the unit's movement, as well as that of their higher headquarters, and find a better idea of where your ancestor was when they were killed. I knew that Warren was assigned to the 814th Tank Destroyer Battalion and in a quick Google search of that unit I found many links that gave me an idea of what the unit did during the war. By narrowing the search to Google Books I found books that discussed the history of the unit that I could view and download in some instances. I also visited WorldCat.org, a website that compiles the holdings of libraries from across the country, and found many other books that I could request through interlibrary loan. Many Army divisions also have associations where past members gather and maintain the history of the division. You are especially lucky if your ancestor's unit still exists, as you can find information on their heritage by contacting the Army historian for the unit or its higher headquarters. For a better understanding of what your military ancestor experienced you can visit The National World War II Museum in New Orleans or visit the website for the U.S. Army Center of Military History which has a myriad of publications and links. I am especially proud of my uncle and his sacrifice. The search for his service history has been fascinating and only makes me the more proud.